AirDrop is a great local peer-to-peer file sharing feature in Mac OS X Lion that is surprisingly useful. That said, the ‘pop’ or drop sound effect that you hear when someone AirDrops you a file has always annoyed me because it’s the same sound effect you hear when you get a new iChat message. Like many other things in OS X Lion, it’s easy to customize with some minor tweaking. 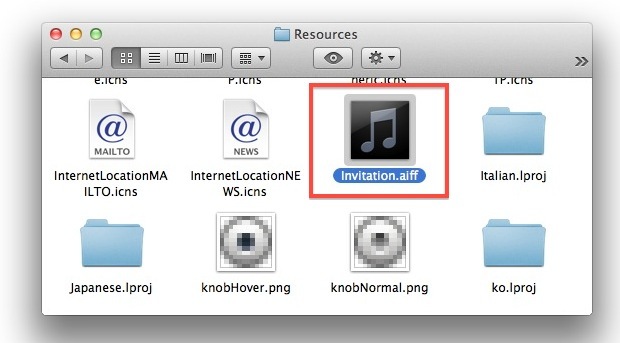 Export the sound effect and name it “Invitation.aiff” and place it somewhere like the OS X Desktop for easy access. A short sound is recommended because you don’t want an entire song playing when someone AirDrops you a file, but it will if you don’t shorten a long audio file. Anytime you want the default sound back, just delete your own Invitation.aiff and rename Invitation-backup.aiff back to Invitation.aiff, kill the Finder, and you’ll hear that familiar iChat pop sound again. Check out some more OS X Lion tips while you’re at it. Cool trick. I recorded a new Lion voice to say “INCOMING” and am using that.